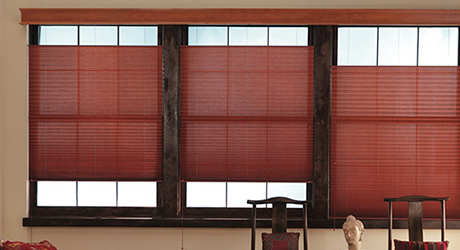 Horizontal sheer shades are a fantastic combination of horizontal blinds and shades. With one single cord you operate both lift and tilt, which gives you amazing control over variable light. You can easily order sheer shades that fit perfectly in your window with this measuring guide. A steel tape measure is much more accurate than cloth measuring tape. Always measure to the nearest 1/8 inch. Don't round up to a half or whole inch. Be careful about transposing measurements. Be sure to always have width and height clearly marked. Remember, always put your width measurement first, and height last (W x H). Also, height measurements are the same as length. When measuring for an inside mount, always record the actual window opening size when you order. The factory will make the necessary adjustments for your product to fit into the window frame. When measuring for an outside mount, add at least 3 inches to every side of the window to make sure your room is private and that you are blocking the most light. Tip: Are your windows uneven? Don't worry, as this is fairly typical when measuring windows. However, if your measurements seem significantly out of square, it might be good to choose an outside mount, which helps to hide uneven windows. This project guide highlights the process for choosing an inside or outside mount, measuring for an inside mount and measuring for an outside mount. It's important to decide whether you want your window treatment mounted inside the window frame or outside of the window frame, above and around the window, before you do any measuring. At The Home Depot, we typically recommend an inside mount because it makes for a simple, clean appearance. One thing to keep in mind is that inside mounted products require a minimum amount of depth to install correctly. Outside mounts have many benefits, such as hiding an unattractive window, or making a window seem even larger than it actually is. When figuring out where to place an outside mounted window treatment, please account for the height of the product's head rail when you make your measurements. Please take time to double check your measurements, as these blinds will be made for your exact window. Measuring for horizontal blinds is simple. It's just two easy steps. In this short video, you will see just how easy it is to measure for an inside mount. Inside mount refers to a blind that is mounted to the inside of your window frame. This type of mount is by far the most common choice, and is highly recommended. An outside mount is typically used in only two situations: if there are obstructions inside your window frame, such as an alarm sensor, or if your window frame lacks sufficient mounting depth to hold your blind. Our web site provides details on how much depth is required to install your blinds with an inside mount. In most cases, the depth that you will need is only a few inches. When measuring for any window covering, it is important to use a steel measuring tape and round to the nearest 1/8-inch increment. The first step is to measure the inside width of your window. rounding down to the nearest 1/8-inch increment after taking each measurement. Begin by measuring the inside width of your window opening in three places: top, middle and bottom. After recording your three measurements, select the narrowest one. This will be the width that you order. Please do not make any deductions to this measurement. The factory will make your blinds slightly narrower so that it can properly move up and down within your window. The second step is to measure the exact height of your window in three places: left, middle and right. Choose the tallest measurement. This is the height you will order. Now that you have completed these few simple steps, you are ready to place your order. It's that easy. Measuring for horizontal blinds is simple. It's just two easy steps. In this short video, you will see just how easy it is to measure for an outside mount. Outside mount blinds are a good choice if an inside mount is not possible due to little or no window depth. Outside mount blinds are mounted outside the window opening, on either the wood trim frame or adjacent flat surface area. The product details page on our web site provides information on how much flat space is required around your window to install your blinds. When you specify an outside mount, we will not take any size deductions. Your blinds will be made at the exact size you specify. Your first step is to determine the width of the blind you will order. If you have trim around your window, simply measure to the far edges of your trim from left to right. If your window has no trim around it, measure a distance from point A to point B that includes any extra width you may desire for light gap coverage and privacy. We recommend adding 2 to 3 inches to each side. Your second step is to determine the height of the blind you will order. If your window has a protruding sill, start from the sill and measure 3 inches beyond the top of your window opening to accommodate for mounting hardware. If your window sill does not protrude, we suggest you begin your measurement 2 to 3 inches below the sill for maximum coverage, and then measure 3 inches beyond the top of your window opening to accommodate your hardware. Record your measurement to the nearest 1/8-inch increment. This is the height you will order. We will not take any size deductions or additions. Your blind will be made the exact size you specify. Now that you have completed these two simple steps, you're ready to place your order. It's that easy.